Caramel colored vintage Pallacio suede handbag with top handle and brass shoulder chain. 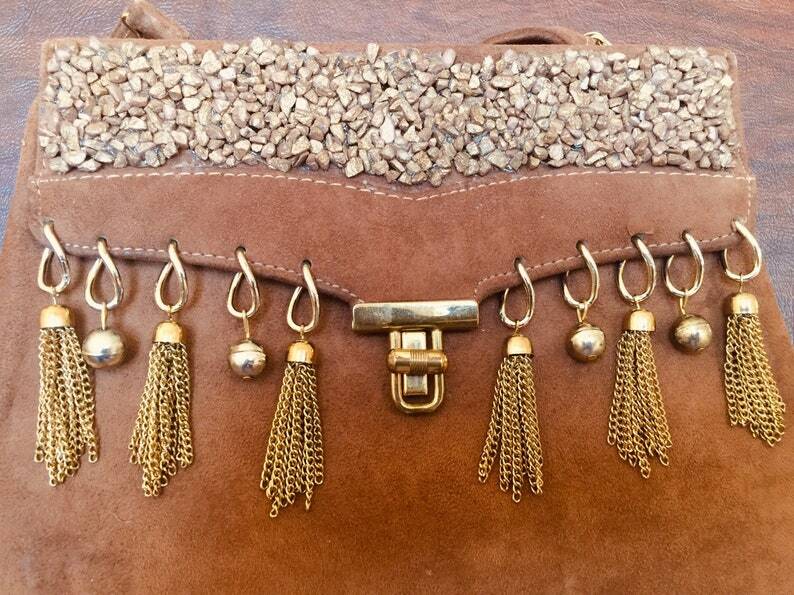 Brass tassels and gold-toned gravel trim. 9.5” x 9” x 2”. Detachable brass name tag. This bag immediately reminded my of my aunt and the bags she used to carry to lunch. They ALWAYS contained small caramel hard candies, which she would freely pass out to small family members who made appreciative sounds! My handbags and other accessories are fashion that’s “re-fashioned”, coming from my vast stash of "found" and vintage purses and other “odd” components I’ve collected from here, there and everywhere. The handbags usually tell a story—often funny, and sometimes downright sarcastic. I have such fun seeing shapes, forms, and textures evolve into special pieces that say something to--and about--the women who carry them. I like working on leather bags with a lot of remaining “life” and my other components can be from old house wares, discarded feather boas, broken costume jewelry and wood or stone carvings.